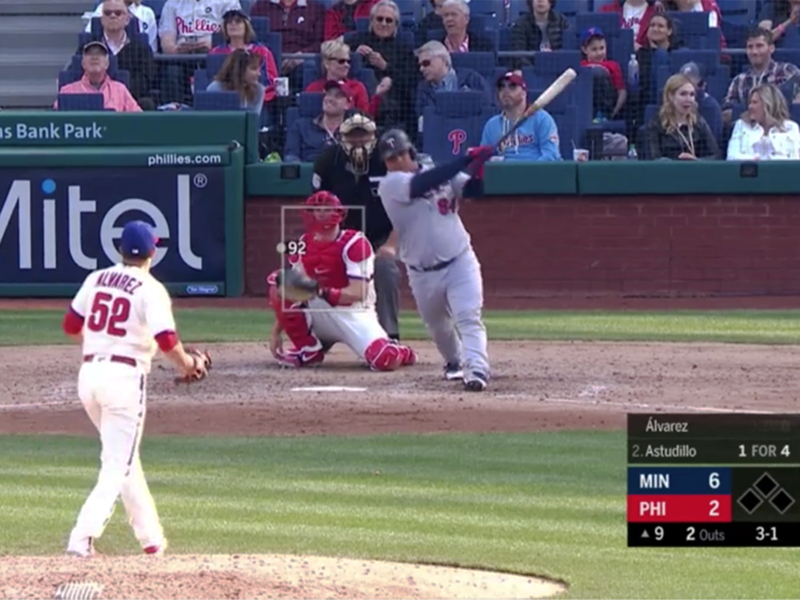 Twins' Utilityman Willians Astudillo Drew His First Walk of Season. It Was Epic! Willians Astudillo drew his first walk and hit his first home run of the season. But he still hasn't struck out. Here he is. And, it’s true, the Minnesota Twins utitlityman’s build is not exactly traditionally linked to baseball ability at any position—5’9”, 225 pounds—let alone at every position. (Okay, “every” is an exaggeration, but only slightly: Astudillo’s 34-game big-league career has so far involved appearances at catcher, pitcher, first base, second base, third base, left field, center field, and designated hitter.) But Astudillo’s presence as a major league player isn’t most notable for his body. No, instead, it’s most exceptional for his approach at the plate—no walks, no strikeouts, no interest in the recent popularity surge of the three true outcomes. In 2,571 plate appearances in the minor leagues, he put the ball in play 2,400 times. 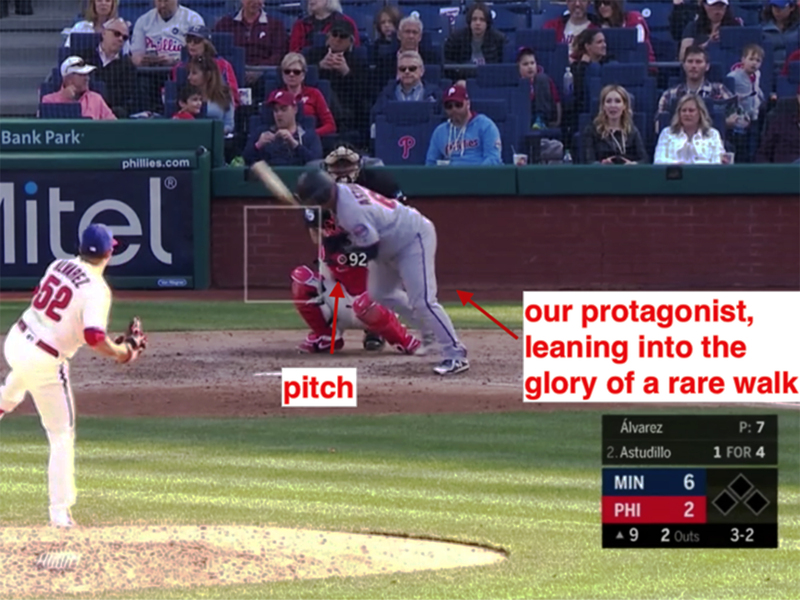 He’s done exactly the same thing so far in the major leagues…. ...which is exactly what was noteworthy about Astudillo’s performance on Saturday. He hit his first home run of the season in the Twins’ 6-2 victory over the Phillies, yes. And Bryce Harper tried to leapfrog over him to avoid getting called out at the plate. The truly memorable feature here, though? Astudillo walked! It’s true. On Saturday, for the first time this season—including his 54 plate appearances in Spring Training—he earned a walk. How does that happen? 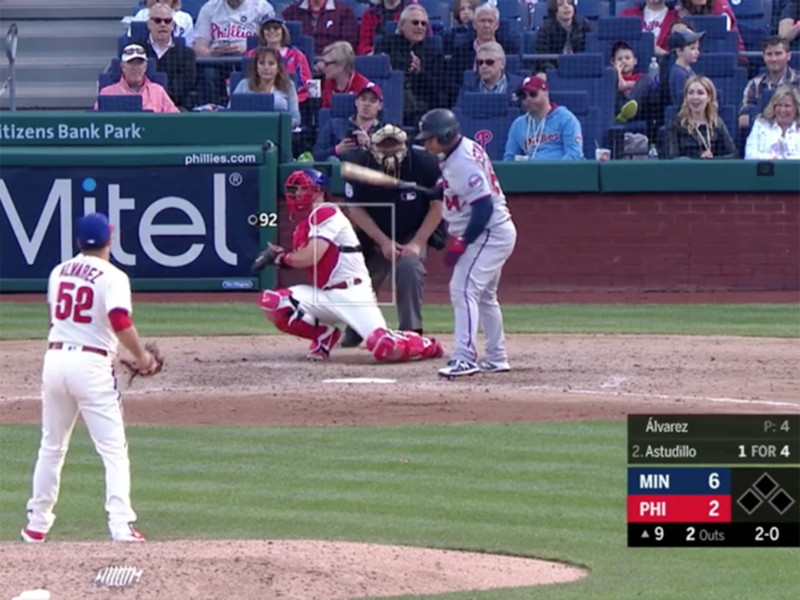 For José Álvarez, you’ve been called in for the ninth inning of a losing game, you’re facing your second batter of the day, and your first pitch here is way outside. Well, just about anyone can manage not to swing at that. 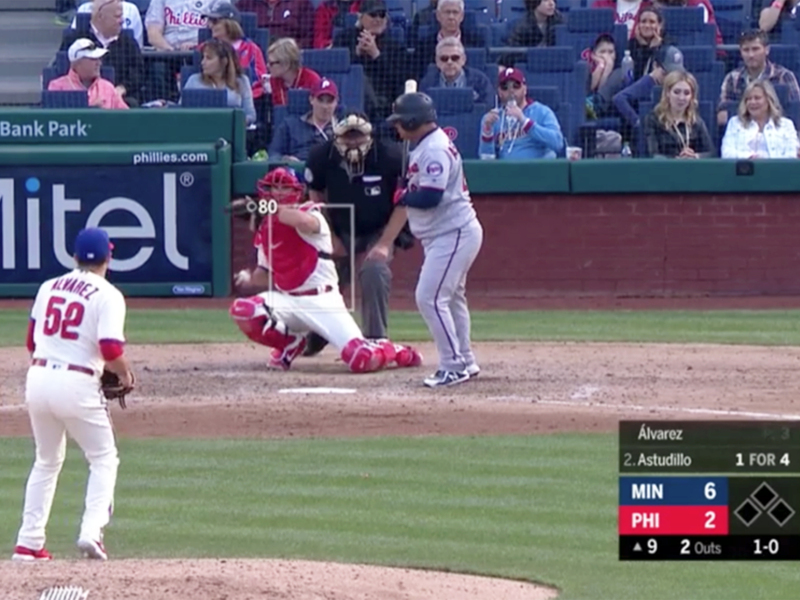 So you try the same pitch again, an 80-mph changeup—and you’re closer, but you’re still not quite there, and Astudillo’s not chasing. 2-0. This is uncharted territory for Astudillo. In 2019, he hasn’t yet gotten to 2-0. You answer with a fastball, and you end up way outside, once again. Further uncharted territory for Astudillo. 3-0! He hasn’t come close in 2019, and he saw it just twice in 2018. He’s got free rein to swing here… and he does, hard enough to make him fall down. Hey, when a guy is walk-resistant, he’s really walk-resistant. On 3-1, you stick with the fastball, and Astudillo swings again, fouling it off. Now, you’re on even footing. 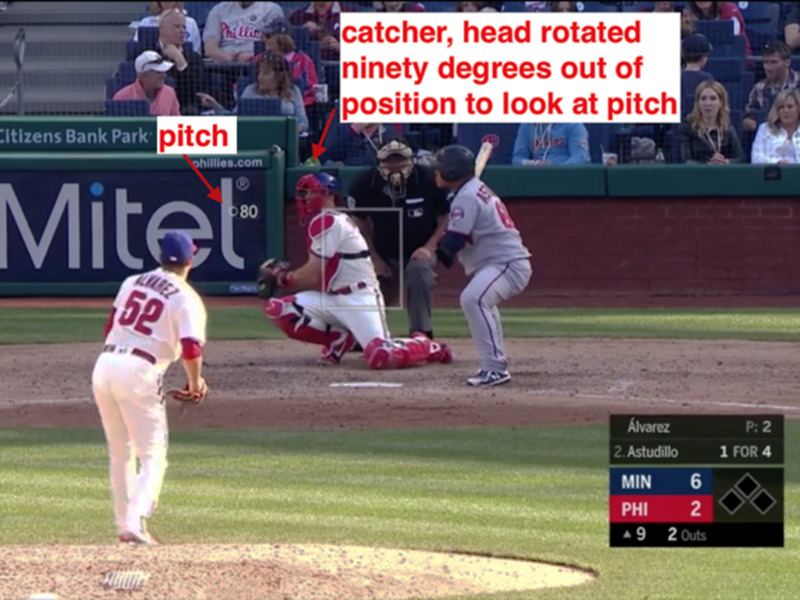 The count is full; Astudillo could make one of his untrue two outcomes come true, or, you know, he could just find a way to put the ball in play, as usual. You keep going with the fastball. It betrays you. Inside. Here lie our hopes for a truly perfectly characteristic stat line for Astudillo, a season with 0 BB and 0 K, March 2019-April 2019. Take heart, though: He still hasn’t struck out.